← More Historical Bad Boys: Bushman Assaults Result in Fatalities Along the Yukon River. Frank Howard was a prospector who was exploring and examining local rock outcroppings in Yakutat Bay. On this particular day, Howard had spotted an outcropping on a barren ridge that showed some promising mineral coloration and he decide to investigate. In order to get to the outcropping, Howard would travel by canoe approximately 3 miles and cross one arm of the Malaspina Glacier. 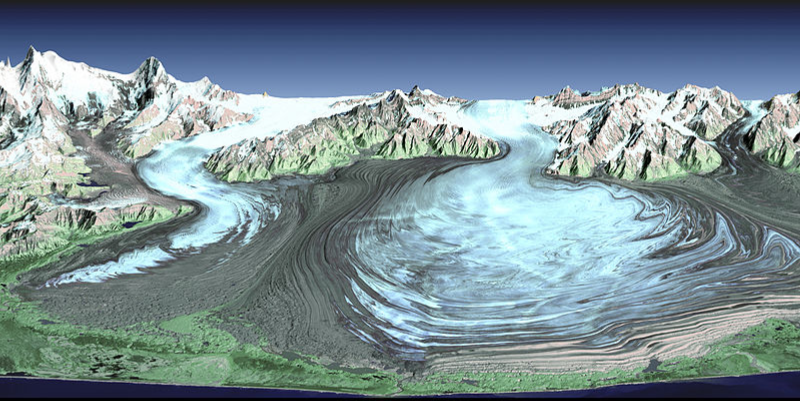 Malaspina Glacier Overview. NASA, 2013, Public Domain Image. multiple crevasses looking for a possible way to climb from the bay to the top of the ice in order to cross. After finding one suitable crevasse, Howard donned his ice-creepers (crampons) and begin his assent. It would take Howard about an hour of careful climbing to reach the top of the glacier. Howard landed with a painful thud and found himself wedged in a deep and narrow part of the crevasse. He was able to free himself and worked himself to a narrow ledge where he sat for a few minutes trying to assess what had happened. He tore a page from a notebook he had carried and lit on fire and cast the flaming paper into the crevasse. As it burned and descended, Howard saw bare ground below and a way to safety. Howard eventually made his way through the crevasse by following the gradually increasing light. At one point he found himself standing in a cavern with light being filtered in from above. As he looked around, he discovered he still had a ways to go since there was no clear opening to the surface above. The beast was aware of Howard’s presence and issued a growling challenge. Howard froze as the hair on the back of his neck sprang to attention and he was overcome with a rank odor. Howard looked around in desperation for a route of retreat, but remained immobile in fear. The two of them sized each other up. The Glacier Beast studied Howard intently. Howard doesn’t describe the length of standoff. It may have been a few heartbeats, or it may have been a minute or longer. Eventually, the Glacier Beast seemed to be satisfied and walked around Howard. Before disappearing into the multiple twists and turns of the sub-glacial cavern, the Glacier Beast turned and gazed again at Howard. Then as quickly as it had begun, the encounter ended. Howard found himself alone, confused and frightened. Eventually Howard’s rational sense returned and he made his way out of the cavern and into the daylight. Howard considered that terror he experienced may have magnified his imagination, but he remained convinced that he had indeed had a standoff with the Glacier Beast. I consider Howard fortunate. Things could have deteriorated extremely quickly if the encounter had escalated. Luckily nothing more occurred. Considering the location as well as the description of the beast’s shape, the odor and the behavior, I am identifying the Glacier Beast as a Boreal Sasquatch. As mentioned at the beginning of this article, Howard’s encounter was reported in the March 1909 issue of the Alaska-Yukon Magazine. I suspect the actual encounter took place in the summer or fall of 1908 since the outcropping Howard intended to examine was not snow covered as it would be during the winter months. If it happened in 1908, the standoff occurred 108 years ago. I have not received any other reports concerning sub-glacial standoffs, but things have not changed in this area of Alaska. 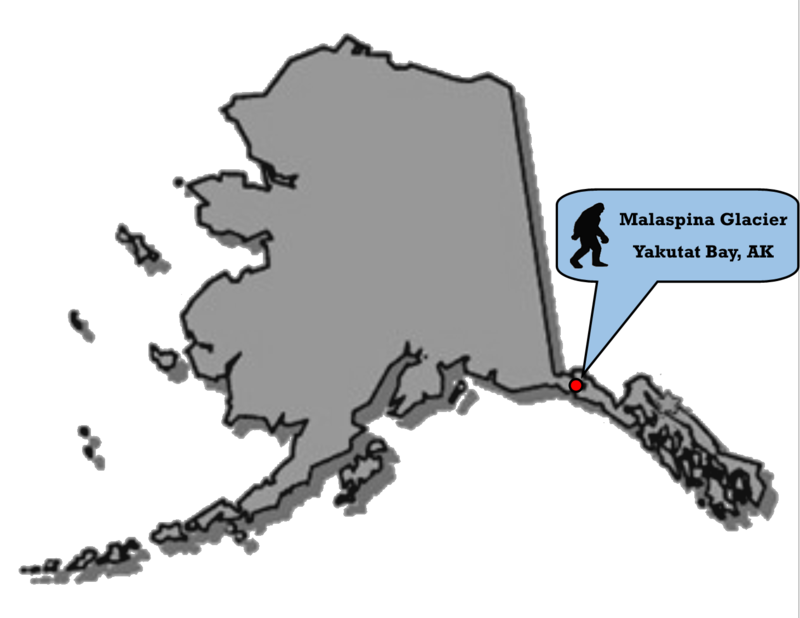 Sightings and reports of tracks in Yakutat Bay and the surroundings areas continue to slowly make their way to Sasquatch Tracker. Ferrell, E. 1996. The Beast in the Glacier in Strange Stories of Alaska and the Yukon. Ken Sturgis – Epicenter Press Inc., Kenmore, WA. This entry was posted in 2016, Historical, Other Behavior and tagged Boreal Sasquatch, Historical, Malaspina Glacier, Other Behavior. Bookmark the permalink. 3 Responses to More Historical Bad Boys: Prospector Has Standoff with the Malaspina Glacier Beast. I will admit I have never been to Yakutat, would be an interesting place to visit with all those nice remote beaches! Maybe this spring, or right after the LL expedition?